Marcos Highway, stretches from the Marikina River at Santolan, Pasig to the Sierra Madre Mountains of Antipolo and Tanay in Rizal Province. It is one of the major thoroughfares connecting the towns of Rizal with Metro Manila with traffic already comparable to if not exceeding the volumes along Ortigas Avenue. It is wider that Ortigas Avenue for the sections along the more populated areas (i.e., Pasig, Marikina, Cainta and Antipolo) and connects to other major roads like Amang Rodriguez, Imelda/Felix Ave., Angel Tuazon, and Sumulong Highway. Widening of the highway is currently underway between Masinag Junction (Marcos-Sumulong intersection) and Cogeo. The increasing traffic volume seems to have also led to an increase in the incidence of road crashes. The past few days saw two fatal crashes along the highway – one near Masinag and another at the Filinvest East main gate. The wife was able to take a couple of photos of the overturned truck and one of the vehicles it hit as the driver lost control of the truck. The area at the main gate of a large residential subdivision in Antipolo/Cainta usually has a lot of people due to the subdivision, the school beside it (shown in the photo) and the commercial and other residential developments beside and across from it. 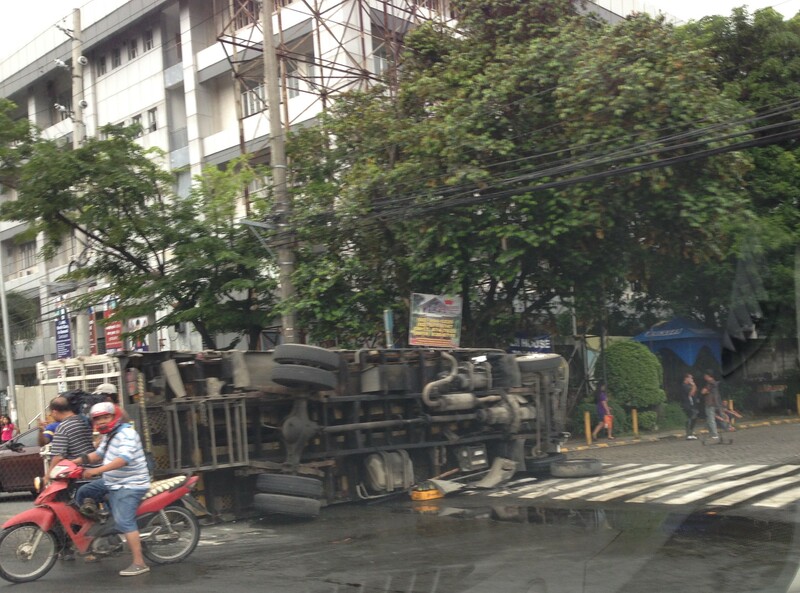 A wayward truck lies on its side at the exit of Filinvest East along Marcos Highway just a few meters from a jeepney stop and a school. The truck with one of the vehicles (brown sedan) it hit before turning on its side. I travel along Marcos Highway almost everyday and notice that there are many (and likely increasing numbers) of aggressive public transport (e.g., patok jeepneys) and truck drivers. Many of these people operating the vehicles are definitely not qualified to drive public utility vehicles based on their behavior on the road. Then there are also the motorcycle riders many of whom weave along the highway, often cutting in the path of other vehicles. Many split the lanes during congested periods and who knows how many vehicles have been damaged by motorcycle riders bumping or sideswiping into them. Many have back riders (riding in tandem?) including children. There are also what looks like entire families riding a single motorcycle with children often not having any protection (usually they are sandwiched between parents). I can only wonder how safe the riders think they are and if they thought about risking the lives of their loved ones before each journey. A friend mentioned that there are regular drag races along Marcos Highway during the wee hours of the morning when the volume of traffic is at its lowest during the day. This goes on despite the police checkpoints along the highway. Are they turning a blind eye to these races? Or are they also involved somehow? Perhaps the LGUs along Marcos Highway should work together to arrest the trend of increasing road crashes. Even the Provincial Government of Rizal should have a say in ensuring safe travel along this arterial as many of its constituents use the road every day. This is a very urgent matter that needs to be addressed in order to prevent the incidence of more crashes in the future. Simple observations of traffic along Marcos Highway show that there are many crashes waiting to happen. Prevention through timely intervention is what’s needed for this road so that we can save lives and limbs. By d0ctrine in Road Safety on August 6, 2014 . Travelers passing the area along Marcos Highway will now notice that the opening across Filinvest East has been closed to traffic. That means no direct turns to or from Filinvest and Vermont crossing the highway. Vehicles would have to take the nearest median opening (U-turn slots). i really like that highway. that’s where i usually travel through when i was in college, from antipolo to psba. but yeah i must admit though passing through sumulong highway to marcos highway can be dangerous if the jeepney driver is a reckless one.